From the author of City of Quartz, a startling new view of Los Angeles, the disaster capital of the world--and what it has to tell us about America at the millennium. Los Angeles has become a magnet for the American apocalyptic imagination. Riot, fire, flood, earthquake... only locusts are missing from the almost biblical list of disasters that has struck the city in the l990s. And the force of real catastrophe has been redoubled by the obsessive fictional destruction of Los Angeles--by aliens, comets, and twisters--in scores of novels and films. The former "Land of Sunshine" is now seen by much of the world, including many of L.A.'s increasingly nervous residents, as a veritable Book of the Apocalypse theme park. 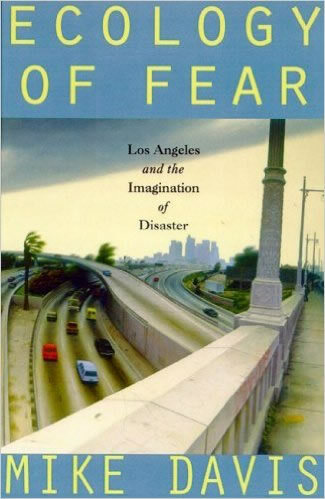 In this extraordinary book, Mike Davis unravels the secret political history of disaster, real and imaginary, in southern California. As he surveys the earthquakes of Santa Monica, the burning of Koreatown, and the invasion of "man-eating" mountain lions, he exposes the deep complicity between social injustice and perceptions of natural disorder. Los Angeles, Davis argues, has deliberately put itself in harm's way. And he shows that the floods, fires, and earthquakes that the city has reaped were tragedies as avoidable--and unnatural--as the beating of Rodney King and the ensuing explosion in the streets. Rich with detail, bold and original, Ecology of Fear is a gripping reconnaissance into the urban future from our most provocative interpreter of the American metropolis. What Mike Davis offers in Ecology of Fear ... is a truly eccentric contribution to the ideological fray of the Golden State.